Rifampin usually is administered orally. When oral therapy is not feasible, the drug may be given by IV infusion. Rifampin should not be administered IM or subcutaneously since local irritation and inflammation can occur. Rifampin should be given orally either 1 hour before or 2 hours after a meal with a full glass of water to ensure maximum absorption. The fixed-combination preparation containing isoniazid and rifampin (Rifamate®) and the fixed-combination preparation containing isoniazid, rifampin, and pyrazinamide (Rifater®) also should be given either 1 hour before or 2 hours after a meal; the manufacturer states that Rifater® should be given with a full glass of water. For patients who are unable to swallow the commercially available rifampin capsules, the contents of the capsules may be mixed with applesauce or jelly. Alternatively, a 1% rifampin suspension can be prepared by emptying the contents of four 300-mg or eight 150-mg capsules and mixing the contents vigorously with 20 mL of Syrup NF (simple syrup), and then further diluting with 100 mL of Syrup NF. Syrpalta® syrup (Emerson Laboratories), or Raspberry syrup (HumCo Laboratories) may also be used to prepare the suspension. The resulting suspensions contain 10 mg of rifampin per mL and are stable for 4 weeks when stored in a light-resistant (amber) glass or clear plastic bottle at room temperature (22-28°C) or refrigerated at 2-8°C. The extemporaneously prepared suspension must be shaken well prior to administration. The suspension is also suitable for use in children when lower doses are needed. For IV infusion, rifampin powder for injection should be reconstituted by adding 10 mL of sterile water for injection to the vial labeled as containing 600 mg of rifampin to provide a solution containing 60 mg/mL. The vial should be swirled gently to facilitate dissolution of the drug. Immediately prior to administration, the appropriate dose of reconstituted solution may be added to 500 mL of 5% dextrose injection and infused at a rate that allows complete infusion within 3 hours. Alternatively, the appropriate dose of reconstituted solution may be added to 100 mL of 5% dextrose injection and infused at a rate that allows complete infusion within 30 minutes. Although 5% dextrose injection is the preferred IV infusion solution for rifampin, 0.9% sodium chloride may be used when dextrose injection is contraindicated; other IV infusion solutions are not recommended. The manufacturer states that the 500- and 100-mL IV infusion solutions containing rifampin should be prepared and administered within a total of 4 hours; precipitation of rifampin from the infusion solution may occur beyond this time period. Extravasation during IV infusion of rifampin should be avoided. If local irritation or inflammation occurs at the site of infusion, the infusion should be discontinued and restarted at another site. Dosage of rifampin is identical for oral and IV administration. In the treatment of clinical tuberculosis, rifampin should not be given alone. The drug is considered a first-line agent for the treatment of all forms of tuberculosis and is an essential component of all short-course regimens. Therapy for tuberculosis should be continued long enough to prevent relapse. The minimum duration of treatment currently recommended for patients with culture-positive pulmonary tuberculosis is 6 months (26 weeks), and recommended regimens consist of an initial intensive phase (2 months) and a continuation phase (usually either 4 or 7 months). However, the American Thoracic Society (ATS), US Centers for Disease Control and Prevention (CDC), and the Infectious Diseases Society of America (IDSA) state that completion of treatment is determined more accurately by the total number of doses and should not be based solely on the duration of therapy. For information on general principles of antituberculosis therapy and recommendations regarding specific multiple-drug regimens and duration of therapy. Because of concerns that there may be an increased risk of acquired rifamycin resistance in HIV-infected individuals with CD4+ T-cell counts less than 100/mm3 who receive intermittent rifamycin regimens, the CDC recommends that rifampin be administered once daily or 3-times weekly and that rifampin regimens that involve once- or twice-weekly administration be avoided in these HIV-infected individuals pending further accumulation of data. The CDC also recommends directly observed therapy for both the daily and 3-times weekly regimens. Adult Dosage The manufacturer states that the usual dosage of rifampin for the treatment of active tuberculosis in adults is 10 mg/kg (up to 600 mg) once daily. The ATS, CDC, and IDSA recommend that when rifampin is used in conjunction with other antituberculosis agents in a daily regimen, adults and children 15 years of age or older should receive a rifampin dosage of 10 mg/kg (up to 600 mg) once daily. When an intermittent multiple-drug regimen is used, adults and children 15 years of age or older should receive a rifampin dosage of 10 mg/kg (up to 600 mg) 2 or 3 times weekly. The manufacturer states that the usual dosage of rifampin for the treatment of active tuberculosis in children is 10-20 mg/kg (up to 600 mg) daily. The ATS, CDC, IDSA, and American Academy of Pediatrics (AAP) recommend that when rifampin is used in daily multiple-drug regimens in pediatric patients, a dosage of 10-20 mg/kg (up to 600 mg) daily should be used. If an intermittent multiple-drug regimen is used in pediatric patients, the ATS, CDC, IDSA, and AAP recommend a rifampin dosage of 10-20 mg/kg (up to 600 mg) twice weekly. When rifampin is administered as the fixed combination containing isoniazid and rifampin (Rifamate®) as part of a multiple-drug regimen for the treatment of pulmonary tuberculosis, the usual adult dosage of Rifamate® is 2 capsules (600 mg of rifampin and 300 mg of isoniazid) once daily. Although the fixed-combination preparation was formulated for daily regimens, the ATS, CDC, and IDSA state that Rifamate® can be used in twice-weekly regimens provided additional isoniazid is administered concomitantly. When used in an intermittent multiple-drug regimen, these experts state that 2 capsules of Rifamate® (600 mg of rifampin and 300 mg of isoniazid) and an additional 600 mg of isoniazid (i.e., 900 mg of isoniazid total) may be given twice weekly using directly observed therapy (DOT). The manufacturer states that Rifamate® should not be used for the initial treatment of tuberculosis and should only be used after efficacy of the rifampin and isoniazid dosages contained in the fixed-combination preparation has been established by titrating the individual components in the patient. When rifampin is administered as the fixed combination containing isoniazid, rifampin, and pyrazinamide (Rifater®) in the initial phase (e.g., initial 2 months) of multiple-drug therapy for pulmonary tuberculosis, the manufacturer states that the adult dosage of Rifater® given as a single daily dose is 4 tablets (480 mg of rifampin, 200 mg of isoniazid, 1.2 g of pyrazinamide) in patients weighing 44 kg or less, 5 tablets (600 mg of rifampin, 250 mg of isoniazid, 1.5 g of pyrazinamide) in those weighing 45-54 kg, and 6 tablets (720 mg of rifampin, 300 mg of isoniazid, and 1.8 g of pyrazinamide) in those weighing 55 kg or more. This fixed-combination preparation provides a higher rifampin dosage than is usually used in the US because rifampin is less bioavailable in this formulation. In individuals weighing more than 90 kg, additional pyrazinamide should be given in conjunction with the fixed-combination preparation to obtain an adequate dosage of this drug. The ratio of rifampin, isoniazid, and pyrazinamide in Rifater® may not be appropriate in children or adolescents younger than 15 years of age because of the higher mg/kg doses of isoniazid usually given in children compared with those given in adults. Rifampin Monotherapy When daily rifampin monotherapy is used as an alternative regimen for the treatment of latent tuberculosis infection, the ATS and CDC recommend a rifampin dosage of 10 mg/kg (up to 600 mg) daily in adults or 10-20 mg/kg (up to 600 mg) daily in children given for 4 months. However, the ATS and CDC state that completion of treatment is determined more accurately by the total number of doses and should not be based solely on the duration of therapy. The rifampin monotherapy regimen should consist of at least 120 doses administered within 6 months (allowing for minor interruptions in the 4-month regimen). When a 2-month daily regimen of rifampin and pyrazinamide is used for the treatment of latent tuberculosis infection when the potential benefits of the regimen outweigh the risk of severe liver injury and death, the ATS and CDC recommend that adults receive a rifampin dosage of 10 mg/kg (up to 600 mg) daily in conjunction with pyrazinamide. This daily regimen should consist of at least 60 doses administered within 3 months (allowing for minor interruptions in the 2-month regimen). 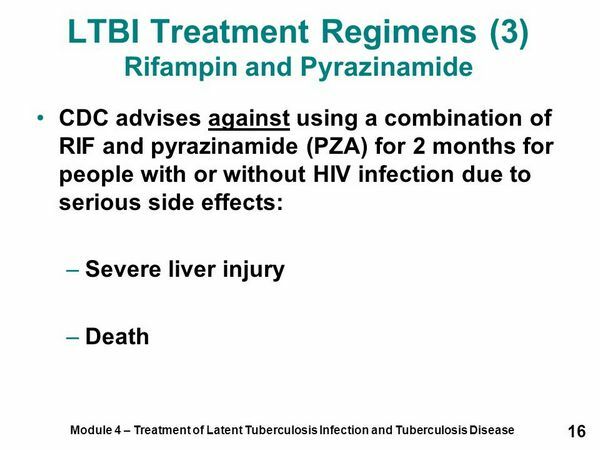 If an intermittent (twice-weekly) regimen of rifampin and pyrazinamide is used for the treatment of latent tuberculosis infection when the potential benefits outweigh the risk of severe liver injury and death, the ATS and CDC recommend that adults receive a rifampin dosage of 10 mg/kg (up to 600 mg) given twice weekly for 2-3 months in conjunction with pyrazinamide given twice weekly. If this intermittent regimen is used, it should be given using DOT. 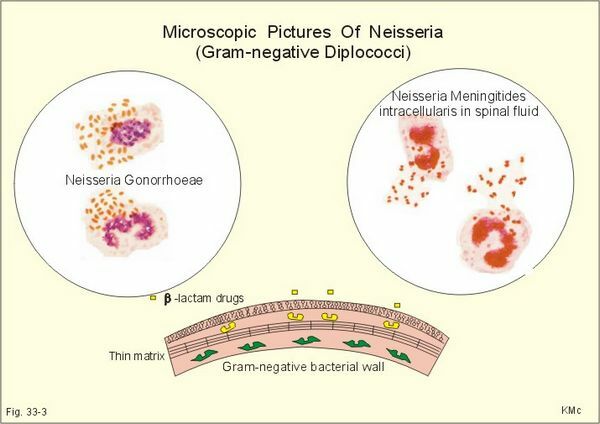 When rifampin is used to eliminate meningococci from the nasopharynx of asymptomatic Neisseria meningitidis carriers, the recommended dosage in adults is 600 mg twice daily for 2 days. Children 1 month of age or older may receive rifampin in a dosage of 10 mg/kg twice daily for 2 days and children younger than 1 month of age may receive 5 mg/kg twice daily for 2 days. When rifampin is used for chemoprophylaxis in close contacts of individuals with invasive meningococcal disease when the risk of infection is high, adults should receive 600 mg every 12 hours for 2 days. The usual dosage of rifampin for chemoprophylaxis of meningococcal disease in children older than 1 month of age is 10 mg/kg (maximum dose 600 mg) every 12 hours for 2 days. Neonates 1 month of age or younger should receive 5 mg/kg every 12 hours for 2 days for chemoprophylaxis of meningococcal disease. When chemoprophylaxis is indicated in high-risk contacts, it must be administered promptly (ideally within 24 hours after identification of the index case) since the attack rate of secondary disease is greatest in the few days following disease onset in the index case. Chemoprophylaxis probably is of limited or no value if administered more than 2 weeks after contact with the index case. When indicated for prophylaxis of Haemophilus influenzae type b infection in adults and children, the recommended dosage of rifampin is 20 mg/kg (maximum dose 600 mg) once daily for 4 consecutive days. The usual dosage for adults is 600 mg once daily for 4 consecutive days. Dosage for very young infants has not been established, but some clinicians recommend a dosage of 10 mg/kg once daily for 4 consecutive days in neonates younger than 1 month of age. For the treatment of multibacillary leprosy, the World Health Organization (WHO) recommends that adults receive rifampin in a dosage of 600 mg once monthly in conjunction with clofazimine (50 mg once daily and 300 mg once monthly), and dapsone (100 mg daily) given for 12 months. Children 10-14 years of age with multibacillary leprosy should receive rifampin in a dosage of 450 mg once monthly in conjunction with clofazimine (50 mg every second day and 150 mg once monthly), and dapsone (50 mg daily) given for 12 months, and children younger than 10 years of age should receive an appropriately adjusted dosage (e.g., rifampin [300 mg monthly], clofazimine [50 mg twice weekly and 100 mg once monthly], and dapsone [25 mg daily]) given for 12 months. The WHO recommends supervised administration of some drug doses included in the regimen (e.g., once-monthly doses). While the 12-month regimen is adequate for most patients with multibacillary leprosy, the WHO recommends that multibacillary leprosy patients with a high bacteriologic index who demonstrate no improvement (with evidence of worsening) of leprosy following completion of the initial 12 months of treatment should receive an additional 12 months of therapy. If a patient with multibacillary leprosy experiences severe adverse effects related to dapsone, dapsone may be discontinued from the regimen and therapy continued with rifampin and clofazimine given in the usually recommended dosages. If a patient with multibacillary leprosy will not accept or cannot tolerate clofazimine, the WHO recommends supervised administration of a once-monthly rifampin-based multiple-drug regimen (ROM) that includes rifampin (600 mg once monthly), ofloxacin (400 mg once monthly), and minocycline (100 mg once monthly) given for 24 months. For the treatment of multibacillary leprosy in adults who cannot receive rifampin because of a contraindication (e.g., hypersensitivity) or intolerance, intercurrent disease, or infection with rifampin-resistant Mycobacterium leprae, the WHO recommends supervised administration of a regimen of clofazimine (50 mg daily), ofloxacin (400 mg daily), and minocycline (100 mg daily) given for 6 months, followed by a regimen of clofazimine (50 mg daily) and ofloxacin (400 mg daily) or minocycline (100 mg daily) given for at least an additional 18 months. For the treatment of paucibacillary leprosy, the WHO recommends that adults receive rifampin in a dosage of 600 mg once monthly in conjunction with dapsone (100 mg daily) given for 6 months. Children 10-14 years of age with paucibacillary leprosy should receive rifampin in a dosage of 450 mg once monthly in conjunction with dapsone (50 mg daily) given for 6 months, and children younger than 10 years of age should receive an appropriately adjusted dosage (e.g., rifampin [300 mg once monthly] in conjunction with dapsone [25 mg daily]) given for 6 months. The WHO recommends supervised administration of some drug doses included in the regimen (e.g., once monthly doses). If a patient with paucibacillary leprosy experiences severe adverse effects related to dapsone, dapsone may be discontinued from the regimen and clofazimine substituted (given in the dosage recommended for the treatment of multibacillary leprosy) for a period of 6 months. Leprosy For the treatment of single-lesion paucibacillary leprosy in certain patient groups (see Single-lesion Paucibacillary Leprosy under Uses: Leprosy), the WHO states that adults may receive a single-dose rifampin-based multiple-drug regimen (ROM) that includes a single 600-mg dose of rifampin, a single 400-mg dose of ofloxacin, and a single 100-mg dose of minocycline. For the treatment of single-lesion paucibacillary leprosy, children 5-14 years of age may receive a single 300-mg dose of rifampin, a single 200-mg dose of ofloxacin, and a single 50-mg dose of minocycline, and children younger than 5 years of age should receive an appropriately adjusted dose of each drug. Although the optimum regimen for the treatment of inhalational anthrax remains to be established, limited experience indicates that early treatment with a multiple-drug parenteral regimen that includes a fluoroquinolone and at least one other active anti-infective may improve survival. Several patients with inhalational anthrax have been treated successfully with a multiple-drug regimen that included IV rifampin 300 mg every 12 hours, IV ciprofloxacin 400 mg every 8 hours, and IV clindamycin 900 mg every 8 hours. If rifampin is used in conjunction with doxycycline or tetracycline for the treatment of brucellosis, a rifampin dosage of 15-20 mg/kg (up to 600-900 mg) daily is recommended. An oral regimen usually is effective for the treatment of brucellosis. The anti-infective regimen should be continued for 4-6 weeks to prevent relapse; however, more prolonged therapy may be necessary in serious infections or when there are complications such as meningoencephalitis or endocarditis. If use of an anti-infective regimen is considered necessary for prophylaxis following a high-risk exposure to Brucella, some experts recommend that the same regimen recommended for the treatment of brucellosis be given for 3-6 weeks.